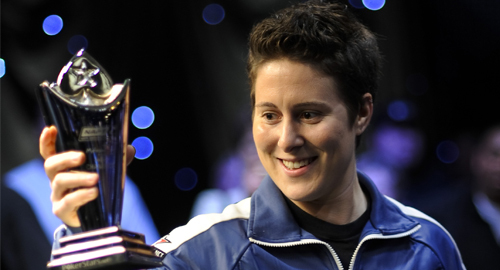 Vanessa Selbst was born in 1984 in Brooklyn, New York. She is one of the best female poker players in the poker history. She is a great finisher of the game and love to do that. She has won millions of dollars playing at various poker tournaments. She started playing poker games professionally since 2006. She became very popular by winning two back to back poker tournaments in 2010 and 2011 i.e. Northern American Poker Tour Mohegan Sun Main Events. Another big victory for Selbst was back in 2010, when she won the Partouche Poker Tour Main Event and collected a real good cash amount of € 1,300,000. Vanessa participated in World Series of poker back in the year 2006 when she was just 22 and the event was $2,000 No-Limit Hold’em, where she got 7th place and collected more than $100,000. In the year 2008, she played at $1,500 PLO and got 1st position with an amount of $227,933. The year 2012, she participated in $2,500 10-Game Mix – Six-Handed, secured 1st place and collected $244,259 an amount of $161,345 made by her in 2012 for the game $1,500 No Limit Hold’em, where she finished 4th. She has made more than $830,920, playing at various world poker tour events. She is a two time finalist of the main event at WPT. In 2008, secured 1st position and collected $115,000 at $1,850 No Limit Hold’em. In 2008, 1st Prize of $26,500 at L.A. Poker Classic $1,000 Ladies Championship and in 2009, she made $74,224 playing at $1,375 No Limit Hold’em. In 2012, amount of $140,295 made at L.A. Poker Classic $5,100 No Limit Hold’em. In 2011, she participated at Doyle Brunson Five Diamond World Poker Classic $ 10,000 Championship Event and secured 3rd position and took home a cash prize of $338,351. In the year 2012, she plated at €5,000 Main Event, in Berlin, got 48th place and took home €13,000. In 2010 she made £145,000 and got 4th position at EPT £20,000 High Roller, London. She won another €11,400 playing at £1,000 No-Limit Hold’em/Pot-Limit Omaha and got 7th place.